A capstone project is usually run at the end of a course for you to demonstrate that you have paid attention and gained a good understanding of how to apply what you have learned. The average length of a capstone paper will very much depend on the course that you are following and the level at which you are studying and your supervisor will share the specific requirements with you. This could be anything from a 10-12 page paper to a 40 – 50-page tome that is going to take a fair amount of your time to complete. If you have not reached the minimum however you may want some making your paper longer tricks. The minimum page count that you are given is an indication of just how much work that you are going to have to put in and the depth to which you will need to cover your topic. Not reaching that requirement is often a pretty clear indicator to the person marking the paper that you may not have put in enough work and effort. But sometimes you may just not have anything more than you feel you can add to your paper to bring it up to the required length. Trying to find ways to make a paper longer without too much hard work can be difficult. Thankfully we have many of the answers that you will need for making your capstone paper length closer to what is required. Discover, for example, some expert nursing capstone ideas we provide. Let’s be clear before we start. The idea is always to reach the minimum length of your paper by providing the reader with value through every word that you use within your writing. Anything that simply boosts capstone paper length without adding any value may be seen as cheating and really should not be used; at least not to excess. 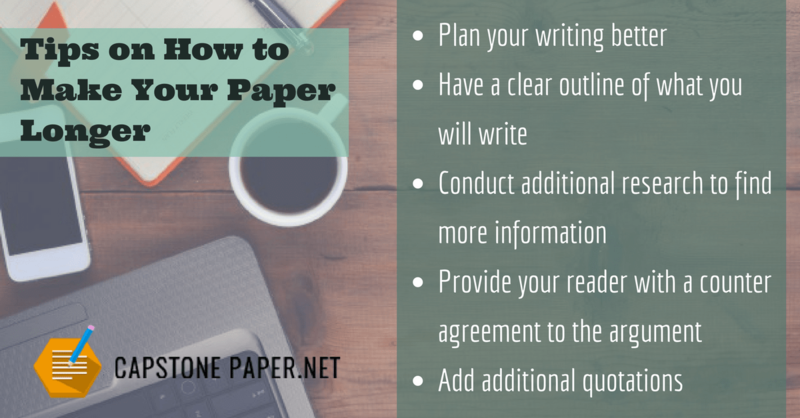 There are many ways however that you can extend the length of your paper without causing any real issues. Adding value to what you have written is always going to be the best way forward to increasing the length of your paper. Plan your writing better and have a clear outline of what you will write. This allows you to identify at a very early point in your writing what sections of your paper may be a little light and where you may need to conduct extra research. This can help you to ensure that you do not fall short in the first place. Conduct additional research to find more information to include within your paper. It is often relatively quick to find more information that will help you to add additional content to areas of your paper such as your literature review or introduction. Ensure that you use multiple sources of information such as journals and other research papers to boost your available information. Provide your reader with a counter agreement to the argument that you are making through your project. Not only does this add extra pages it will also show the evaluator that you are able to consider different viewpoints. Add additional quotations to support what you have to say. This can add weight to what you have to say while boosting your page count considerably if done well. How to Make My Paper Longer in Other Ways? The following tricks to make your paper longer are unlikely to add any real value to your paper and should be used sparingly. Do not use contractions of any form within your writing. Remove don’t, it’s and there’s and replace with the longer versions. Not every font takes up the same amount of space when selected in 12pt. Experiment with fonts to find one that will add that extra little length without affecting readability. Use a double space after each and every period of your writing to add that little extra length to your paper in a way that will not be easy to spot. Increase the font size of just the periods and commas within your writing, this will not be easy to spot but will add a few extra lines to your paper. Split longer paragraphs into two to boost an extra line from each. 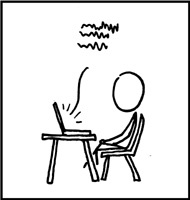 This can actually improve readability in many ways also. Try adding an extra word or two to any paragraphs that end close to the right – hand margin so that they will drop into an additional line. Add a footer and header with page numbers, project title and other information to take up some of the space on each page. Can I Use a Make My Essay Longer Generator? There is also our quick and easy tool that will generate additional words within your text to help extend it considerably. Just paste in your text and the tool will instantly work through it to add extra modifiers to all of your verbs and adjectives as well as selecting longer versions of the words and phrases that are within your work. Our specialized tool with pretty much instantly add extra pages to the length of your paper without making any changes to your formatting and page settings. If you want to check how many pages is my paper, click here. Of course, the best answer is always to provide a paper that will impress the reader in every way without having to add fluff to it. Our expert and very professional services are able to provide you with superior support through some of the most perfectly qualified experts you will find online. They work with you closely through our services online to ensure that your paper meets all requirements and is totally unique and error free. 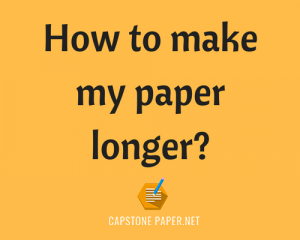 Follow these useful “make my paper longer tricks” or get in touch with our writing and editing specialists for expert support to make your capstone paper perfect!